It's one thing if you want to keep chickens. Even the standard breeds are modest in size, and bantams are even smaller. You don't need much space to keep a modest flock of even 6 laying hens. Cows are a different story. They're huge, compared to a chicken. They need significantly more of everything - food, water, shelter, space. More time to get into production too. So you'd be pardoned for thinking that all 4-H members in the dairy or beef clubs are in familes with active dairy herds, or some beef cattle. There's a way around this however. It is possible to lease a cow. My granddaught does this. She goes to the barn to care for "her" cow, a Jersey, training her to lead and be mannerly in the show ring, and learning how to groom to show standards. Josie, from a family friend last summer. Her parents bought her another cow, and last winter Chloe was born. accustomed to being washed. Alexa is entering the cow / calf class, heifer class, and showmanship class. Chloe looks very patient as Alexa gives her a through shamoo and rinse. been clipped on the face, body, and legs for a smooth, trim appearance. blow dryers are part of the grooming kit - before this afternoon's show time. 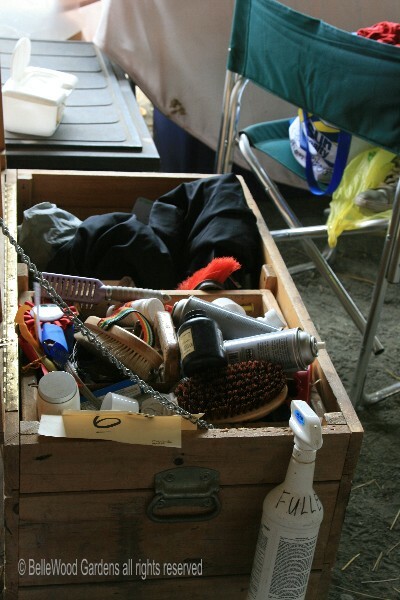 Here's someone's grooming kit, to prepare their cow for the show ring. a scotch comb, tail comb (for ratting tail hair), clippers, sprays, and more. clipped. Her tail has been brushed out - good bush and elegant shape. What are they doing up front? 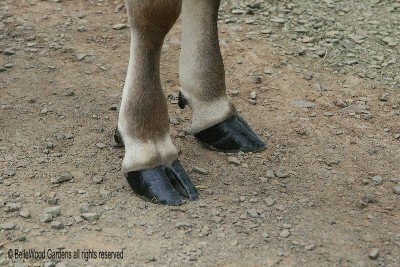 Oiling her hooves for that glossy, polished, cared for appearance. 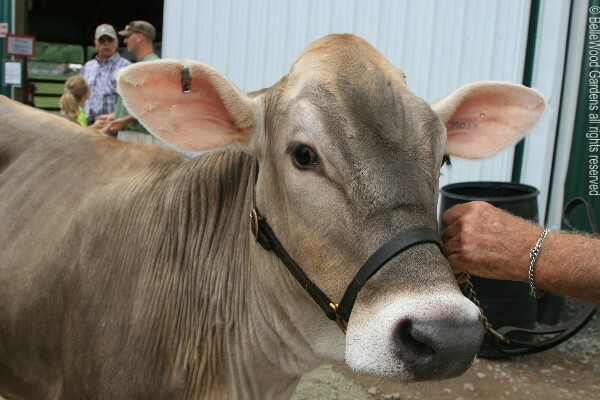 Here's a really charming brown Swiss heifer. She's wearing a nice leather show halter. 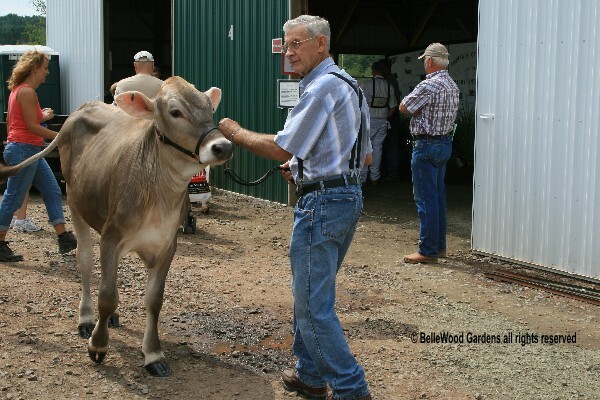 Different Brown Swiss heifer, about to enter the show barn. A group of Jersey heifers and their handlers outside the show barn, waiting for their class to be called. 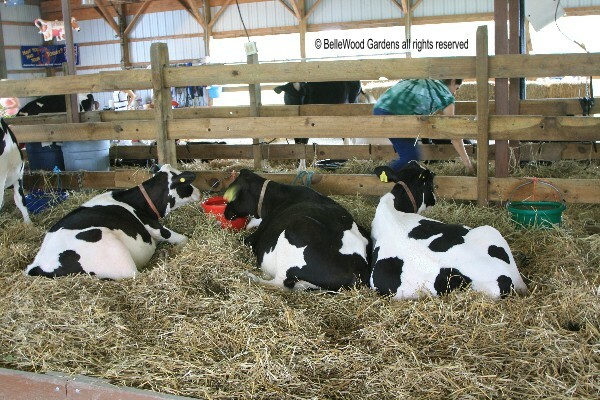 Some Holsteins, just taking it easy and loafing in the cow barn. The brown and white cow is, I believe, an Aryshire. Dairy cows should be shown with a bag mostly full of milk. since, among other things, it may cause the cow to be nervous and hard to handle. 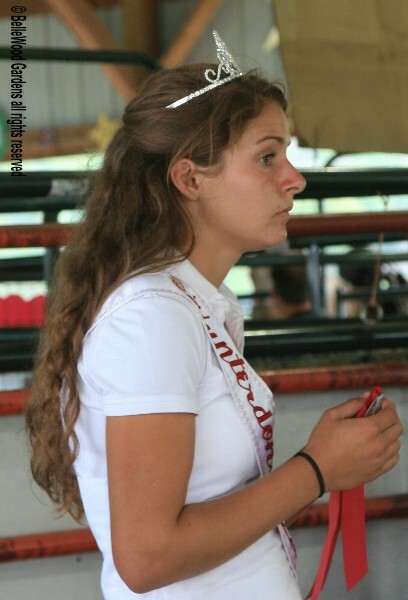 if she just came out of the show ring. Just look at that elegant styling of her tail. In the show ring. There are conventions for showing cows. Stand to the left of your animal. Associations. Sarah will make presentations promoting milk and the dairy industry.